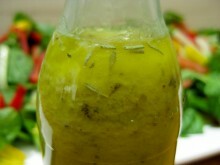 Easy Italian dressing recipe that will keep in the fridge for a week! In a small bowl, mix together the garlic salt, onion powder, sugar, oregano, pepper, thyme, basil, parsley, celery salt and regular salt. To prepare dressing, whisk together white vinegar, canola oil, water and the dry mix.